Those [dances] were done away with before I was born. But my dad was there, when he was a young man. There were ceremonial dances and all kinds of fancy clothes to go with that. Ceremonies and festivals are accompanied by drumming, singing, and dancing. 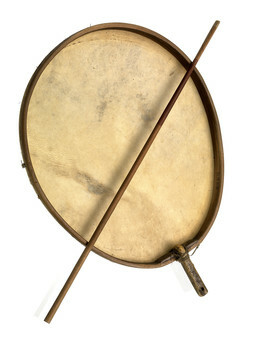 Tambourine drums like this one are made of animal skins stretched tightly over bent willow wood frames. Iñupiaq drummers hold the backs of their instruments toward the audience, striking the rims with wood or ivory wands to make a deep, booming sound. Sylvester Ayek: Issaq tauq taimana pualiagaat, qilautmik. Sylvester Ayek: Tiŋmiaqpaumuuq uumataan niviŋa. Unipkaam ivruma aipaanizaq. Sylvester Ayek: Unipkaaq. Aipaanizaq unipkaami ayuqatuqsimagaa Niglaniġmik. Sylvester Ayek: Sauyamiguuq ayuqatuutiyaa uumatiminun niviŋa asrriblugu. Uumataan tiŋmiaapaum. Herbert Foster, Sr.: Kasakhutik aasi. Sylvester Ayek: Ii’ii kazagutigalugu. Aasin ‘aa utiġniami imatnaa sauyiniġmik. (Yes, they played the drum. And when that person returned home, he showed them how to make a drum.) […] And we have a great deal of respect for drums, we don’t play with them. Herbert Foster, Sr.: Yeah, yeah. Sylvester Ayek: We don’t play with them. They have spirits. And if I was to – I keep lots of drums at home. I respect them, way more than one-hundred percent. I just don’t drum any old time, any old way. Because I know they have spirits. And we were taught not to abuse them, or play with them in any way. Herbert Foster, Sr.: Not a toy. Sylvester Ayek: Yeah, not a toy. Sylvester Ayek: Ikkiuruq uuma timiŋa sauyam, tipsriniaqłutik ipkua, qiruktaamik. Ikkimik iwaqłalutik, sauyiuġatut. Kinisalugu ‘aa piġiłuu. Izipłuu, aiġvum aġiaġuanik. Taamna kaŋiani, qiliqtaq saasrkamik piyaat. (They stretched walrus stomach. This one on the end, with the tied ends, they call it a saasrkaq [cup]. Taamna ‘aa ivua, papłumik. Aasin ‘aa mumimik mumilalutik, sauyautiiraigaat taamna mumiq. Aġiaġuq taamna, aivġum aġiaġua igiaqłuu. Maatnami ałłanik atuqsaaluġaatugut izisranik naguaġizuitkiut. Piġlalutik ipkua iwalumik kitigiuqsimaraatut. Tallimanik izaŋninik tagisautiiruamik. […] And today we use any kind of hardwood. I usually pick up something like maple, or oak, or hickory from Home Depot or Lowe’s. Herbert Foster, Sr.: Maybe if you make one, you could order rubber. Sylvester Ayek: We tried all kinds of membrane and they don’t sound the same. We like to use walrus stomachs. Its lots of work and expensive, but we prefer that. Herbert Foster, Sr.: The tune of this one, they use it so much in one piece, like from walrus, and it’s got one tune. Sylvester Ayek: And the walrus stomachs, they can last for two years or three years, if you take care of them. And when we are using them, we don’t use them dry. We wet it with untreated water, or spring water. In the city we use filtered water, we don’t use tap water. Rachel Riley: Now, our houses are so hot that the reason why we don’t use skins is, because when it’s really dry it tears right away. They start using these nylon from the stores that they bought. It has to be special, too. Any old material can’t make that noise. […] It have to be some kind of – I seen some men, they check which one works better. That’s what they use at Anaktuvuk now. They don’t use skin because it tears off real fast – just like the umiaq [skin boat] at the museum. Those white, nylon. Jana Harcharek: Tiŋuaniñ, ii, isiksramignik kipiġniuġuurut. Piiyaivl.utin aasii samuŋa inna kiamiłługu piiyaqługi isiksramignik kipiġniuġuurut, aasii taima suaqsimmata, isilitqigataqługit. (Yes, they seek the membrane of the liver to cover their drums. And I’m noticing there’s sort of this resurgence in going back to the original after having tried, you know, modern materials. There are young people wanting to go back to the original.